Freedom Equality Righteousness Independence Brotherhood Civil Rights Justice In Honor Of Dr. Martin Luther King Jr. 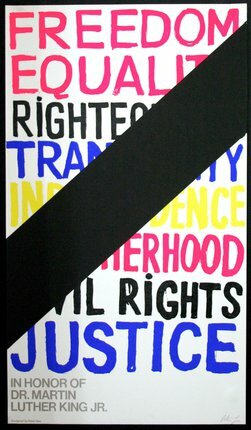 Striking protest poster for the civil rights movement created in honor of Dr. Martin Luther King Jr. Peter Gee (1932–2005) was a British-born artist and developer who spent most of his life living and working in New York City. He was active in the pop art movement of the 60s.